Periodical discussion 1st in 2015 at Vec Consultant. 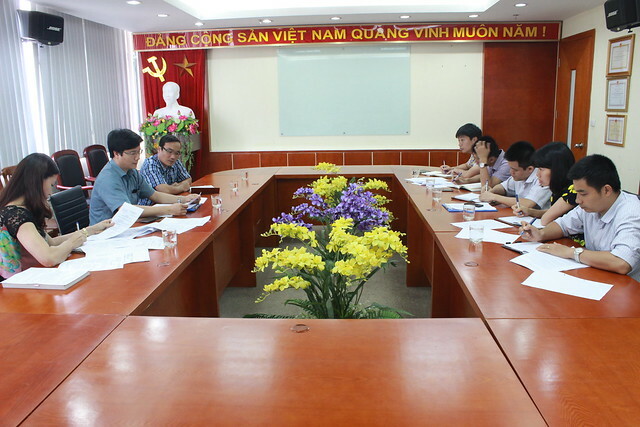 Implementing Decree 60/2013/NĐ-CP dated 19th June 2013 about implementing periodical discussion regulation in workplace, on 7th May 2015, Vietnam Expressway Consultant joint stock company conducted the periodical discussion 1st in 2015 between employers and employees of Vec Consultant. At the discussion, Mr. Nguyen Quang Loc – Director of company gave a brief overview of result of production and business of the company in the first 4 months in 2015 including revenue, profit, payment for reward fund, welfare, trade of union, payment for assurance fund. In this discussion, the employees representative put forward many ideas to company such as: consider advance payment for site engineers; change working time; place for document storage, provide software, equipments, machines; visitation regime, mobilize engineers at site. The discussion was taken place in a serious atmosphere, and exchanged frank and democratic with the cooperation of two parties. In the discussion, emloyers explained issues, requirements of employees. This is also a strong spiritual bridge between employers and employees expressing determination and efforts of Vec Consultant’s staff in productional and business plan of the company in 2015.